I'm looking for a little bit of advice regarding repairs to the leather interior of my Rover. Until I joined this club, I didn't realise just how much I'd neglected my car and how badly it is in need of some TLC. 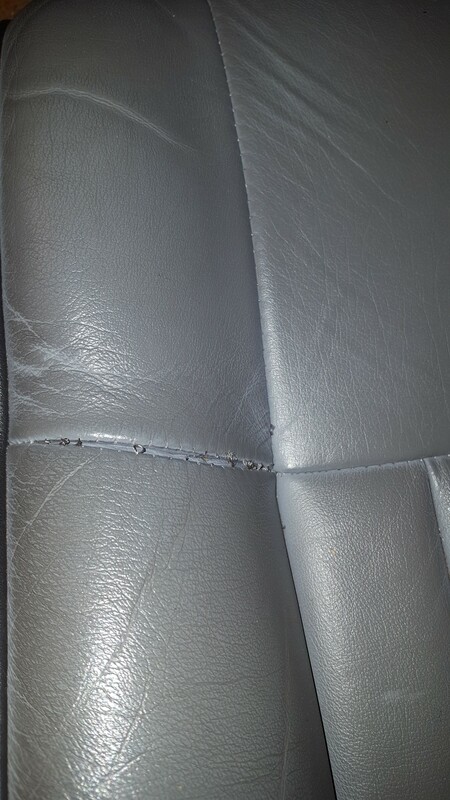 I'd not taken any care of the leather interior (no feeding/polishing or anything else) during the entire time I've owned the car, so it's now come back to bite me. The drivers seat has the splits both sides, the passenger seat only on the one side. Has anyone got any recommendations as to the best way of repairing the seats and door cards? Also, I have to ask...is it real leather used on the seats and door cards, or is it some kind of plastic imitation or faux leather? I have the seats out of the car (as it needs some welding work doing) and I've seized on the opportunity to do some cleaning and feeding, and the material seems really thin compared to other leather I've seen. It's as real leather as most other cars but it wasn't a £30k time at the time and is now 20years old. Any shrinkage pulls on the seams and they we're a 'tight' design when new, eg not 'rusched' (if that's how you spell it). Split seam repairs are simple in theory and difficult in practice. With patience, some needles and some leather thread (thicker than usual, specifically for leather work, not thread made from leather) you can do it yourself without removing the entire cover. Getting the part of the cover peeled off the seat for access that you need to get to the stitching from the back is difficult, not impossible, but difficult. To restitch you ideally need two needles and two threads to mimic the machine stitching and give a nice strong stitch that won't risk just pulling through the leather and causing a tear. It's difficult to describe how you do it so I'd recommend searching on Youtube for leather upholstery repair (same techniques apply to cars as to sofas) and see what helps best. Whatever you do, don't glue that seam! Especially don't use superglue, it ruins leather. A good quality contact adhesive is best, get the most expensive your budget can tolerate, cheaper contact adhesives tend not to be able to withstand the hot-cold and dry-damp cycles of car interiors. If the door cards are the same construction as the standard interior you should be able to dismantle them into their component pieces and reglue the errant edges. I'd recommend a thorough clean and feed before attempting any repairs as the leather will then be the most willing to move where you want it as it should be nice and supple. A good quality contact adhesive is best, get the most expensive your budget can tolerate, cheaper contact adhesives tend not to be able to withstand the hot-cold and dry-damp cycles of car interiors. The late 80s and 90s were really bad for lightweight leather interiors, the grade used is closer to what you'd expect for clothing than upholstery. This is partly because getting the heavier grade leathers to conform to the seat shapes is more difficult and, of course, heavier grade leather is generally more expensive. Vulgalour wrote: Split seam repairs are simple in theory and difficult in practice. I was afraid of that. The moral of the story here is don't be a rear end and look after your interior! Vulgalour wrote: A good quality contact adhesive is best, get the most expensive your budget can tolerate, cheaper contact adhesives tend not to be able to withstand the hot-cold and dry-damp cycles of car interiors. If it will do the job, I don't mind spending a few quid to do the job properly. Have you any suggestions for the right maker of adhesive to use? Thanks for the information. Hopefully I will get it back to some semblance of decent in the near future. Evo-Stik Impact Adhesive should be sufficient for door cards. Generally, the quicker the fumes get your head spinning the better the glue will work I'd avoid shop's own brands, they tend not to be strong enough, and while Gorilla Glue is good I've personally not had much luck getting it to work longer term, unlike the Evo-Stik stuff. Leather coming away from the edges is caused by failure of the plastic rivets that were used to secure the inserts to the cards. I simply chiselled them off and replaced them with nylon bolts. Also, just as with the seats and headlining, the scrim foam back fails and just disintegrates to orange-coloured powder - hence, there is no bond between the leather and the insert - it just holds up because it's folded around the insert and the insert is held tightly to the card. When the rivets fail, the leather (or material) starts to work itself out. I used double-sided carpet tape for mine. The Tesa brand (the extra-strong variety, not their normal "strong" one) is very good, and the Scotch extra-strong carpet tape also seems like it would do the job. It's basically a less messy way of getting a good quality adhesive in place than using a tube or pot of glue. I did the front faces and about 10mm all the way round the edges on the back. The stickiness of the tape on the material/leather side also holds the heads of the nylon bolts I replaced the plastic rivets with, so you can torque them back up easily. Seat fabric repair is pretty specialised. Having stripped two complete interiors over the past 2 years, I can tell you it's not just a cushion cover that peels off easily and can be put back on. Steel rods hold the cover down in "H" shapes to the foam, bound by steel hoops to similar rods embedded in the seat foam. I'd recommend a proper upholsterer for getting the seats done to be honest, but they'll charge a small fortune. A total recover was about £1,000 last time I asked. Yes, the door cards article will be in the next edition of The Viking, due out in a couple of weeks (hopefully!). Johnny 216GSi wrote: Leather coming away from the edges is caused by failure of the plastic rivets that were used to secure the inserts to the cards. I simply chiselled them off and replaced them with nylon bolts. What sort/size of nylon bolt and where did you get them from? I also discovered when I took the door cover off, that at least 2 of the clips that hold it in place had been damaged by someone taking the cover off before. I looked on Rimmers site and although the part is listed (EYC10047), it's NLA of course. They have another part to supersede it (EKM100100P), however it looks NOTHING like the original. I assume these will work, but do I have to modify the door in some way, such as removing the "Insert" the old clips socketed into? M5 * 12mm countersunk - because the head stands less proud than any other type of nylon bolt I could buy. I also thought of buying steel hex bolts and filing the heads down so they're maybe a 1mm thick - you could probably still get a spanner on them while you fit nylon nuts to the other side. The aim is to minimise the "bump" seen through the fabric from inside the car - the original rivets are a bump about 1mm thick. Remember you've lost the cushioning scrim foam, so they'll show more. They reason I'm saying nylon, for at least the nuts, is because the technique I used relies on carpet tape holding them in place (read the method below) and if this fails at any point at a future date, then you have nuts on the back and a spinning bolt - which means you're stuck. Making at least the nuts nylon if not the bolts as well means you have recourse to a knife or a heat source such as a soldering iron to snap / melt the fastenings off if you need to. 2. Clean up the metal door cards - I used a paint scraper to get rid of the sticky powder, then sand-papered them down to bare steel front and back - you may want to take a short cut and just get the surfaces clean ready for glue or tape. 3. Run strips of 50mm wide carpet tape (the extra or super strong varieties - DON'T skimp - Tesa extra strong or scotch extra strong) to completely cover the outer face, leaving the carrier/backing on the outer surface. Cut up the tape into 10mm strips and do a run all round the edge on the back surface that fits against the door card. 4. Use a knife to cut the carrier tape in 1cm squares centred on each rivet hole. Remove the carrier tape in this 1cm square, poke a 5mm bolt through the hole to the rear and fit a nut on the back. Torque up the nut holding the bolt steady on the front face. The carpet tape should be more than strong enough to bond to the inside face of the bolt head. You can test that it's worked by loosening the nut on the back but tighten it gently again so they're all done-up for the next stage. Repeat this for all rivet holes so you have a set of fresh bolts fitted. 5. Score the carrier tape on the front so you can peel off about 50mm / 2 inch strips - as the carpet tape is also 50mm/ 2 inches wide, this means you can peel off 2-inch squares of the front tape carrier at a time. 6. Peel off a square in the centre. Position your material so it lines up as it should - handle hole / leccy window hole (if you have one) in the right place and equal material all the way round on the reverse. Then apply pressure to stick the material down to the uncovered tape. 7. Repeat 6 in a line working left to right, then move up a line of tape and keep doing it so you gradually stick down the material all over. All of the Rover door card materials shrink if they're washed - not sure about the leather - but you may have to stretch the material as you're sticking it down to make sure it reaches where it should. 8. When the front is done, turn to the reverse side. Cut the carrier tape again that you put round the edges on the back, peel a bit off at a time, fold over your material and stick it down. 9. Now remove the nuts from the bolts you poked through in stage 4. Remember they're only held in place by the carpet tape on the front face sticking to the underside of each bolt head. Carefully offer up the insert to the door card and align all the bolts so they poke through without forcing anything. Now you can put the nuts on and you're done. Those clips EKM100100P look like they'll do the job. You can also pinch those clips (as originally fitted by Rover) from any scrap door cards you can get your hands on - they just snap out of the plastic bridges glued to the door cards. I've never used those replacement items myself, but you can generally trust what Rimmer sells - they're a top grade supplier and wouldn't sell anything that's substandard as far as I know. Last edited by Johnny 216GSi on Mon Jun 26, 2017 11:23 pm, edited 1 time in total. Johnny 216GSi wrote: M5 * 12mm countersunk - because the head stands less proud than any other type of nylon bolt I could buy. WOW! !...I was not expecting full detailed instructions. Thanks for this, means I wont be pestering you with questions for the next few days! Johnny 216GSi wrote: Those clips EKM100100P look like they'll do the job. I've never used those replacement items myself, but you can generally trust what Rimmer sells - they're a top grade supplier and wouldn't sell anything that's substandard as far as I know. Thanks for all the advice, folks. Hate to admit to my source but I am sure that I have got these clips from some rover 25 door cards which have a similar clip attached to the door frame. I find they have to be cut out of the door with cold chisel or tin snips and then released later on the bench as they seem to be a one way plastic clip and very hard to remove in one piece. You have to remember that these end door screws on the door cards are very fragile and do not need to be tight at all. They also break due to people slamming the door a lot!